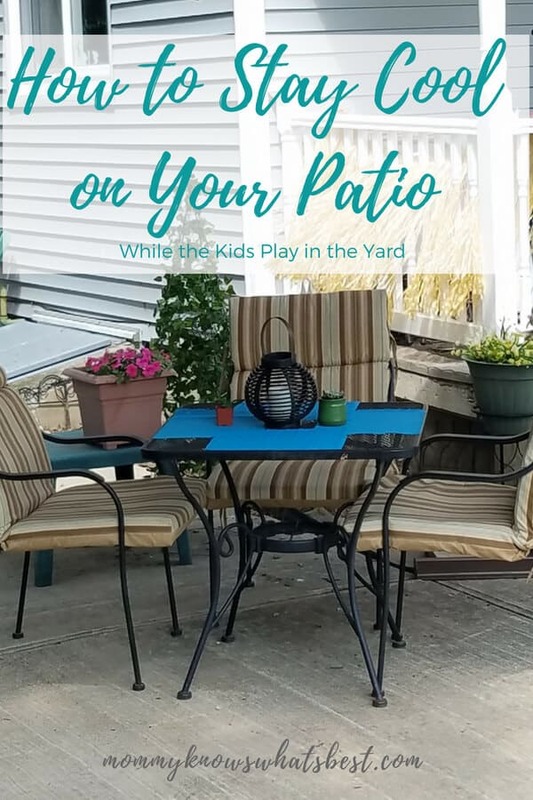 Learn how to stay cool on your patio as the kids play in the yard. (This post contains affiliate links). 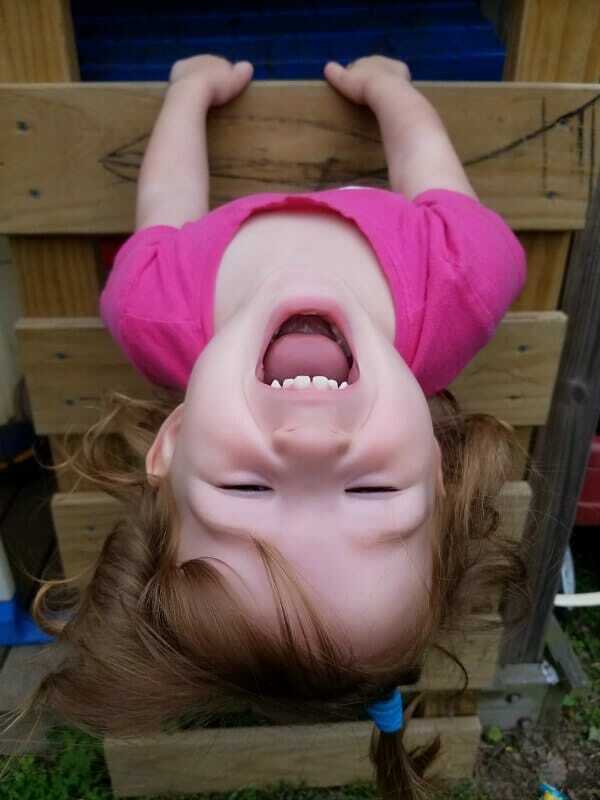 My kids LOVE to be outside. We have a nice sized yard with a fun treehouse my husband built, and they have a whole bunch of toys to play around with. When the big kids play outside, I’m able to get some work done indoors while being able to check on them from the back door in my kitchen. I trust that they will stay in the yard and stay away from any strangers walking by on the railroad property a few yards from our fence. But when the toddler is outside, that’s another story. I mean, just look at the girl. She is FEARLESS. She follows her older siblings around as if she’s the same size and can do the same tricks. I’m not one to helicopter my kids, but I don’t mind being nearby should something happen. 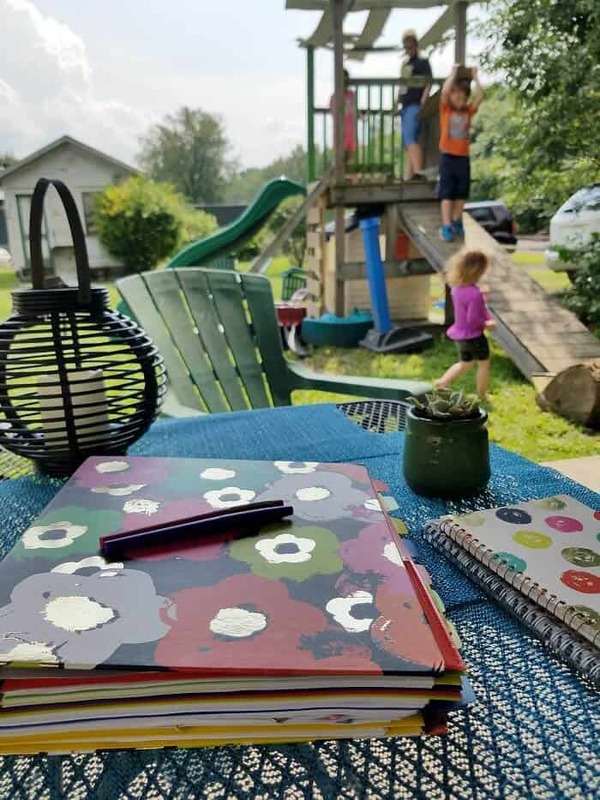 When I sit on my patio, I can see my whole yard and keep an eye on my toddler while she plays with her older siblings. But man, it can get hot out there, especially in the summer. The last thing I want is to feel uncomfortable while trying to enjoy being outside with the kids! The older I get, the worse I tolerate the heat. I have found several things that greatly improve my chances of staying cool on the patio. Did you know it can be 15°+ cooler in the shade? Staying in the shade on your patio is one of the best ways to stay cool. Use a patio umbrella. A patio umbrella is probably one of the easiest ways to achieve shade on your patio. 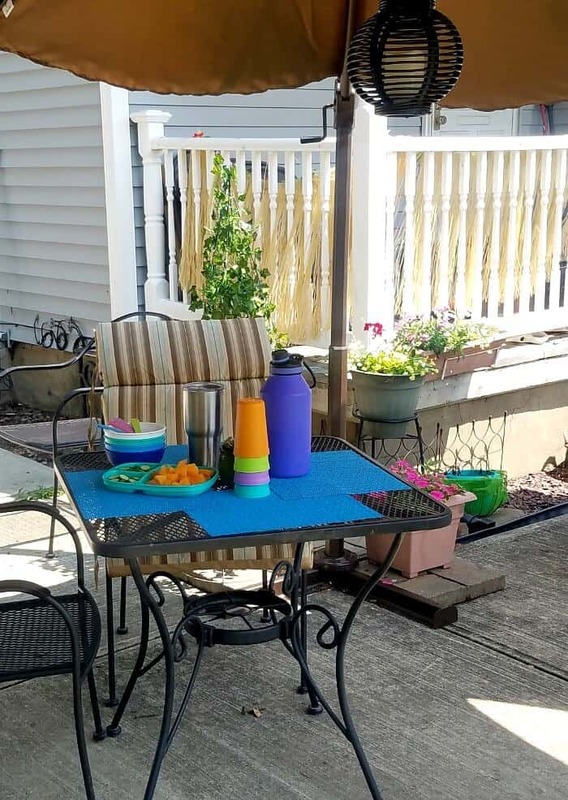 Most patio umbrellas are used in conjunction with tables, fitting in the center of the table so that you can sit at the table and enjoy the shade. Some of them have the ability to tilt, providing you with shade depending on the position of the sun. Other umbrellas, like a cantilever umbrella, does not have a center pole and doesn’t need to be used with a table. It has a single freestanding pole on one end and can be easily tilted in a variety of positions to provide maximum shade. 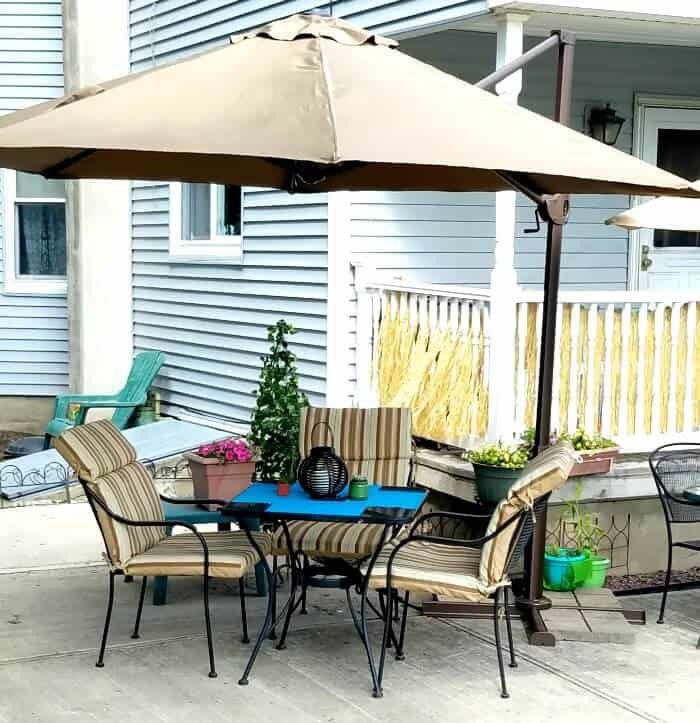 A bonus of this type of umbrella is that it can be on the side or edge of a patio and leaves enough space for a few chairs and even a small table (or a large table if you prefer without extra chairs). 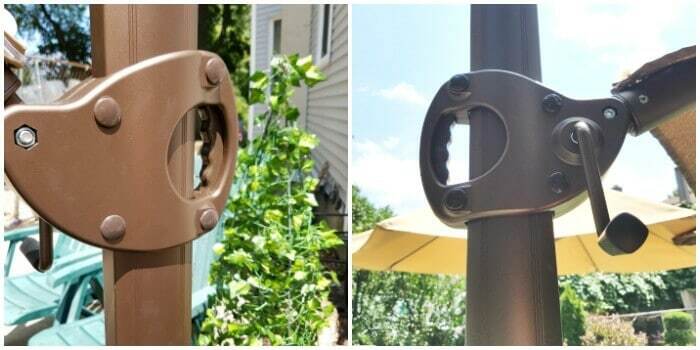 The pole doesn’t obstruct the view of anyone beneath the umbrella as the pole is off to the side instead of the center, so even when it is closed, it is out of the way. Some cantilever umbrellas use crank handles to tilt and open, while this one on my patio uses a vertical sliding handle to move into 5 different tilt positions. Abba Patio sent me this umbrella to test, and after having a hot summer, it was very much a blessing for me! It’s easy enough to use that even my kids can move it to the desired tilt positions (the ones they can reach, at least). It didn’t come with weights, but 12 x 12 patio pavers fit into the base perfectly and keep it standing. In addition to my regular patio umbrella, the cantilever umbrella has helped to provide maximum shade so that I can enjoy my patio time while my kids are playing outside. I get some work done, and don’t have to sweat while doing it. Use a Sail Shade. A sail shade is a piece of fabric that is stretched over a space to provide shade. While it can’t be tilted as easily as an umbrella, it can still provide sufficient shade and keep you cool on your patio. Did you know that even when you’re sitting in the shade, you can get sunburn? That’s not going to keep you cool! 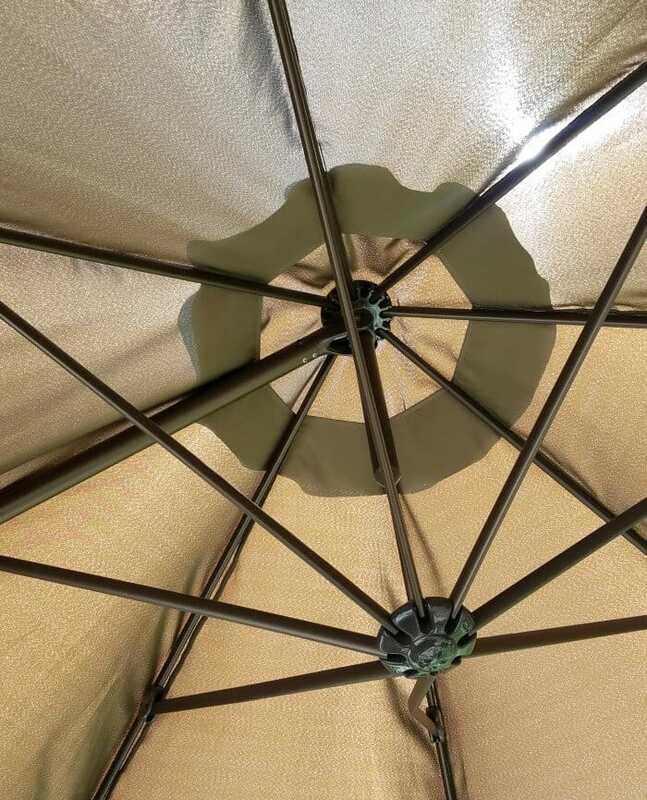 The sun’s rays can still get through the cantilever umbrella top! Apply sunscreen before sitting on your patio to prevent getting burned. Don’t forget about some lip balm with SPF in it! Did you know that staying hydrated helps to keep your body cool? Our body stays cool by sweating, using whatever water content is in the body to keep the temperatures at 98.6. Without enough water in your system, your body cannot sweat, resulting in you feeling warmer (among other problems, including feeling cranky!). Do you want to be too warm and cranky when you’re outside with the kids? I would think not! 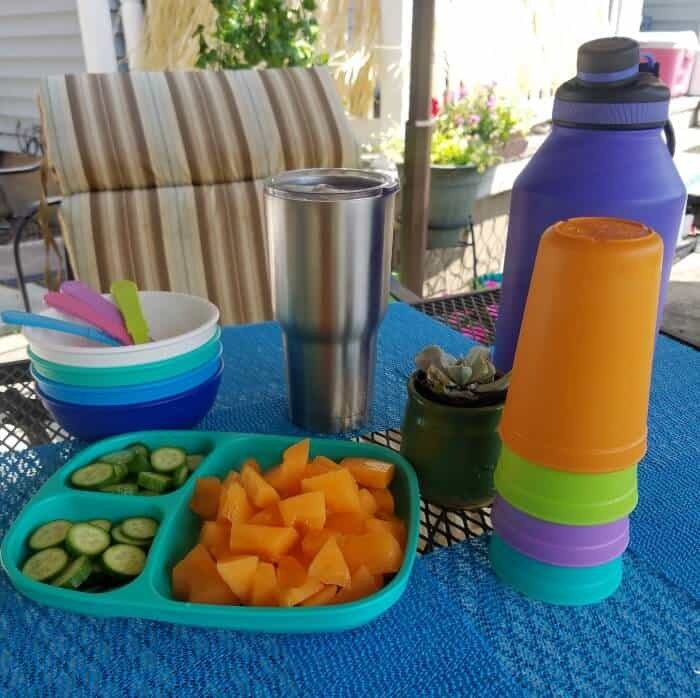 When I’m out on my patio, I have my stainless steel water bottle filled with icy cold water, and I keep my stainless steel cup on the table. For the kids, I have a stack of Re-Play cups for when they need to hydrate. We also eat some cool snacks, like cucumbers and fresh fruit, which not only help to cool us down but can also help with hydration. Ever try a cooling towel? Once a cooling towel is wet and activated, it can help you cool down. 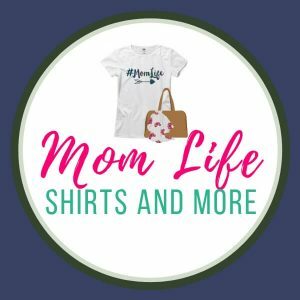 They’re awesome for wearing during sporting events or while doing work outdoors, but they are great to wear while sitting in the heat on the patio. And if the kids ask you to join in on their antics in the yard, you can wear the towel while playing with them, too! On days when the wind is still, a fan is a must to help keep the air circulating on the patio. You can get a big patio fan, but even a small battery-operated fan on your table would do the trick. BONUS: Fans can help keep the bugs away, too! That is definitely a plus in my book since I HATE the annoying bugs of summer. One last way to stay cool on the patio is to get a misting fan instead of just plain fan for your patio. A misting fan allows a small amount of water to pass in front of a fan, creating a cooling mist. These fans can be handheld, tabletop, or on a stand. These are very refreshing on a hot summer’s day! The handheld ones are awesome for taking on walks with the family, too! Any combination of these tips would help you stay cool on your patio! How Do You Stay Cool on Your Patio? How do you stay cool on your patio? Have any extra tips for how to stay cool? 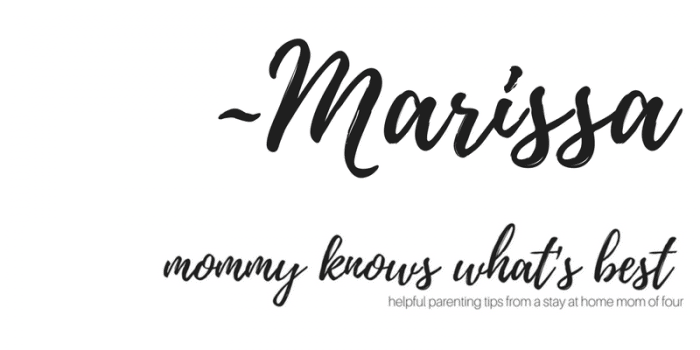 I’d love if you’d leave a comment below! Many thanks to Abba Patio for sponsoring How to Stay Cool on Your Patio! You can visit their Amazon Storefront to help create the perfect backyard destination.